If you came to this post looking to buy Bacardi dark rum, Bacardi Black, you can do so here. Bacardi Black is a medium-bodied black rum aged in heavily charred oak barrels which is then filtered through a secret blend of charcoals. According to its makers, the flavors of Bacardi Black are of sweet, tropical fruit, buttery caramel and vanilla notes that then give way to a smoky liquorice and molasses finish. 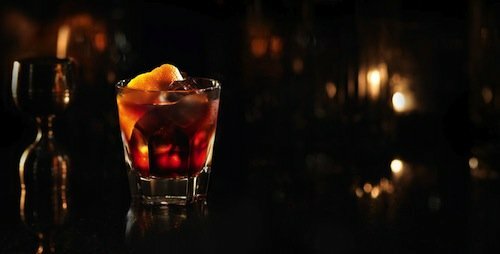 According to its website, Bacardi recommends that Bacardi Black be drunk as a shot or with intensely flavoured mixers such as coffee liqueur. Personally, I love my Bacardi Black with Coke and lime, or with tropical fruit juice. But…let’s stick with the coffee liqueur suggestion for a minute. As an example, Bacardi recommends a cocktail called The Nocturno. Fill a tumbler glass with ice cubes and pour in the coffee liqueur. Slowly pour in the Bacardi dark rum and stir briefly. Cut a round “coin” of orange peel and hold a lit match just above the drink. Hold the orange peel (colored side down) above the lit match, and squeeze the peel over the flame. Finish up by dropping the twist into the drink. That’s it: drink and enjoy! Bacardi is a West Indian rum originally produced in Cuba. First sold commercially in 1862, by 2014, Bacardi was the best-selling rum in the world (it has since lost and regained this position several times in the past few years). 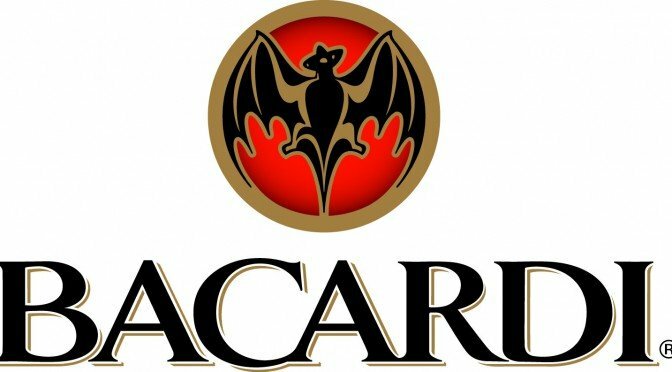 Bacardi Limited, the company that produces Bacardi rum, is the largest privately held, family-owned spirits company in the world. 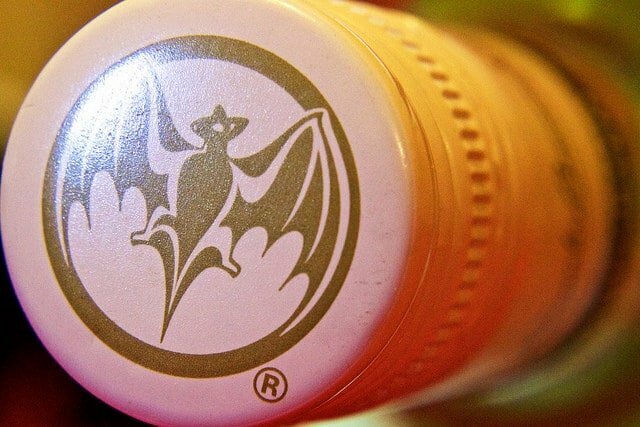 Originally known for Bacardi white rum, which was innovative in its use of charcoal as a filtering agent and was arguably the first clear, white rum in the world, Bacardi Limited now has a portfolio of more than 200 brands and labels, including Havana Club rum (in the US), Grey Goose vodka, Patrón tequila, Bombay Sapphire gin, Dewar’s Scotch whiskey, Martini & Rossi vermouth, and Martini Prosecco (a sparkling wine that I love!). When I say ‘Bacardi rum‘, what image comes to mind? If you are like I was until very recently, you pictured a bottle of clear liquid with the words Bacardi emblazoned across it. Is that what you visualized? Well, you wouldn’t be very wrong if you also envisioned a bottle of Bacardi dark rum, Bacardi Black, or one with a light gold-colored liquid, Bacardi Gold. What?! Yes. Let me tell you a bit more. Until very recently, my drink of choice was a Myers’s Rum with ginger ale. Four months ago found me in Dar es Salaam, the city of my birth, at the Protea Hotel. On the evening in question, I was in the mood for some Myers’s. Upon ordering, the waiter duly informed me that they didn’t have any in stock. Not sure what else to drink, I walked up to the bar to see what else could satisfy my craving. First, I looked for dark rums. After all, that is what I was in the mood for. They had Captain Morgan and…Bacardi Black. No, that is not a mistake. I did indeed say dark rum and then mention Bacardi. Much to my surprise there existed a Bacardi dark rum called Bacardi Black! My curiosity won over, and I decided to give Bacardi Black a try. I won’t lie: I didn’t think it was anything to write home about. I found it less fragrant than Myers’s Rum and very similar to Captain Morgan. Perhaps, I have a bias towards Myer’s Rum. I still haven’t made up my mind on Bacardi Black yet. Nonetheless, I was happy to find out about this new drink. 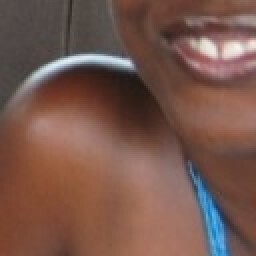 A few weeks later, I found myself sitting at the bar at Martini’s Lounge, on Ngong Road. I had already had a few drinks that evening so was taking it slow in the drinks department. As my friends (and I) chatted away, I had time to take stock of Martini’s extensive bar. I liked what I saw! I hadn’t seen that well-stocked a bar in ages! Martini’s had all sorts of liqueurs and countless whiskies. There were bottles of all shapes and sizes. For some, I couldn’t even identify what type of alcohol they contained. Then I saw a Bacardi rum that was neither the usual clear Bacardi nor the Bacardi dark rum that I had discovered a few weeks earlier. This Bacardi rum, Bacardi Gold, was of a light gold color. The manager at Martini’s was gracious enough to let me taste a shot of it. Honestly though, there’s little I could tell about Bacardi Gold‘s flavor from drinking it neat. Was Someone Trafficking Rum Using the Bacardi Name? In hindsight, I first thought this must be illegal rum, falsely using the Bacardi name. I felt there was no way that all these different types of Bacardi could exist without me having a clue until then. Off to the Internet I went to do some research. First stop: The official Bacardi website. I found out: not only were all these Bacardi products genuine, but Bacardi also had a slew of other products beyond the three I’ve mentioned so far. READ ALSO: Konyagi vs. Uganda Waragi. Bacardi Gold is a “distinctive, smooth, and mellow golden rum that delivers subtle flavor and classic Bacardi quality. It is the perfect Bacardi rum for those who enjoy the relaxed, good fun, and fine times that being with friends is all about”. I don’t know about you, but to me, those all seem more like marketing statements rather than information about how each Bacardi rum tastes. A little more research brought me to the Bartender’s Guide to the Galaxy. There, I finally found the information I was looking for. Bacardi Black: The richest spirit produced by Bacardi is a blend of selected rums aged for periods of up to four years. Charcoal-filtered for smoothness before mellowing in oak barrels, this rum retains the rich flavor and full body of the original blend without any harshness in taste. 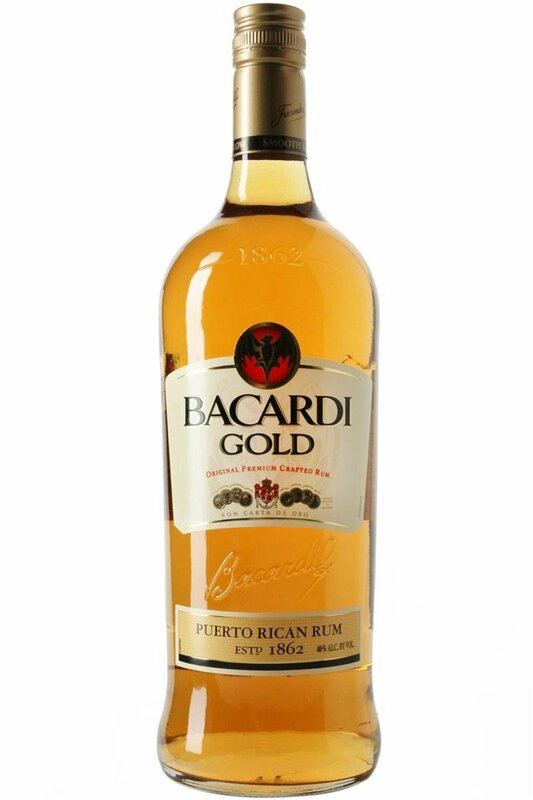 Bacardi Gold: A rum made with the same blend of light spirits as Bacardi White Rum, but that is aged for up to two years and is not filtered again after its time in oak casks. The result is a smooth, amber-colored rum with a fuller body and a pleasing wood flavor. Bacardi White: Bacardi White is blended, charcoal-filtered, aged for a least one year, then charcoal-filtered again to produce a subtle, delicate rum that is clear in color, light in body and dry in flavor. Clearly, the distinguishing factor between Bacardi White, Bacardi dark rum, and Bacardi Gold is how long they are aged. Bacardi white rum is aged less than Bacardi gold rum, which in turn is aged less than Bacardi dark rum. Since age is usually an indication of the sophistication of an alcohol, we can also conclude that Bacardi Black is finer than Bacardi Gold, which in turn is finer than Bacardi White. Looking at my own experience with rum, I now understand why I prefer Myers’s Rum to Captain Morgan’s Spice Gold to white Bacardi rum. Is Bacardi Gold Dark Rum? No, Bacardi Gold is not dark rum but rather gold rum. Gold rum, also known as amber rum, is a medium-bodied rum which has usually undergone aging. Gold rums gain their dark color from aging in wooden barrels (usually the charred, white oak barrels that are the byproduct of Bourbon whiskey production). They have more flavor and are stronger-tasting than white rum. Gold rums can be thought of as being halfway between white rum and dark rum. I hope the mystery is now a little clearer than when you first began reading this post. Before I go, I would like to share one more tidbit with you that might be useful in selecting when and how to drink each of these three rums. Believe it or not, whiskey will generally give you a worse hangover than gin, and red wine will give you a worse one than white wine. I read somewhere that this is because the lighter alcohols are more filtered. They, therefore, contain fewer impurities for the body to get rid of. For that reason, when you are drinking in large quantities, you might just want to stick to the clearer rums. Might that be why Bacardi White is more common than Bacardi dark rum and Bacardi Gold? P.P.S. Are you a blogger who is frustrated about not earning enough from display ads on your blog? If so take a look at this free service from a Google Certified Publishing Partner that helps you do just that. Thanks, I work in a liquor store in New Zealand and when I googled for info on the different Bacardi’s, your article came up and was easy to understand and entertainingly written, I’m sharing it with all my colleagues :-), again thanks for taking the time to write it! Have you tried Bacardi 8 Year Old? I hadn’t even heard of it until recently preferring the common white Bacardi Superior with my Coca-Cola. I was in a hotel bar in Poland and they didn’t have any normal Bacardi but I spotted this other bottle with Bacardi emblazoned across the label. Try it and see what you think? Welcome to ChickAboutTown. I have seen Bacardi 8 Year Old before but I have never tried it. Thanks for the tip: I’ll try it at the next opportunity. Can you try and describe how it differs from Bacardi Superior? FIRST TIME I PURCHASED BACARDI WHITE RUM. IT HAS A VERY FINE TASTE AND I ENJOYED THE DRINK. EARLIER I USED TO TAKE OLD MONK RUM AND CELEBRATION DARK RUM. Welcome to ChickAboutTown! Thanks for sharing. I’ve never had either Old Monk or Celebration. I’ll be sure to watch out for those! The barcardi white does not taste the same it is now horrible , it smells all wrong and tastes dry , have they changed it ? Welcome to ChickAboutTown! I’ve not noticed anything different with Bacardi white. What country did you drink it in? Wow, I would hate to be drinking Dry Cane instead of Bacardi White. It’s such a shame that people do that! We live in Australia and have also noticed the difference between the old superior and the relabelled carat blanca. So maybe there really is something that’s changed beyond the label. Thanks for sharing. Hi! I am in Caribbean, Trinidad to be specific and reading this article. I had to comment cause I’m sipping on Barcadi Coconut…. Its a white rum like the classic Barcadi yet its taste is sweeter and very smooth going down! Welcome to ChickAboutTown, and thanks for your comment. Bacardi Coconut sounds nice! I’ll have to find out if that’s sold in Tanzania. Tell me, do you usually drink it neat? Or do you mix it with something? I’d like to know for when I try it! Welcome to Chick About Town, and thank you for your comment! I am so glad I could help you find out what the difference between these rums are. I am a big fan of the cocktails you mention. Do you make your Mojito with white rum and your Cuba Libre with dark rum? Found this blog during a random search for Bacardi gold vs black. I value the time you took to research and categorize all three individually, never knew that bit about darker=stronger hangovers. Cheers from NY!